Then, the different colors reflect off the back of the inside of the drop, and when they pass through the front of the drop again, they are refracted once again. A rainbow is always directly opposite the sun from the observer's perspective. 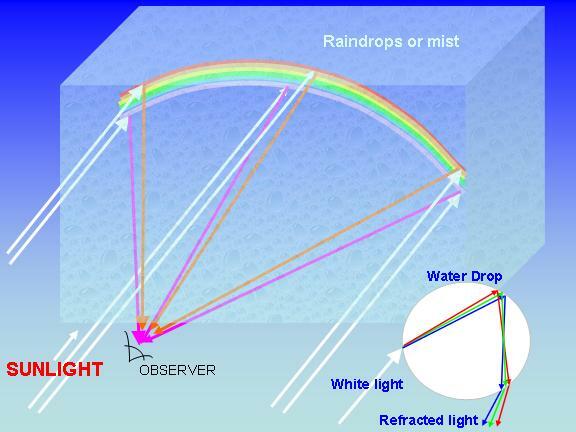 This explains why rainbows are only seen when the sun is low in the sky, usually in the late afternoon (in which case the rainbom will be seen to the east of the observer), or early morning (in which case the rainbow will appear to the west of the observer). If the observer could see the shadow of his head cast by the sun, it would be in the exact center of a circle where the rainbow forms the top portion of that circle.